An anti-inflammatory is any substance that helps reduce inflammation. They can interrupt chemical pathways that signal inflammation, by reducing (down-regulating) the number of inflammatory molecules, or by increasing (up-regulating) signaling molecules that reduce inflammation. You are probably most familiar with the NSAIDS (Non-Steroidal Anti-Inflammatory Drugs), such as ibuprofen and aspirin that treat pain and swelling by reducing inflammation. There are also naturally occurring anti-inflammatory compounds found in many foods and spices. Antioxidants are substances that bind to reactive oxygen species, therefore inactivating them, which reduces cellular damage. The downstream effects of antioxidants can often help reduce inflammation. Because of this, many antioxidants actually act as anti-inflammatories. There are plenty of foods and spices that contain antioxidants, and therefore have anti-inflammatory properties too (1). Avoiding pro-inflammatory foods: In addition to the anti-inflammatory foods we talked about earlier, there are many pro-inflammatory foods as well. These include processed high-sodium meats, sugared and artificially sweetened sodas, salty snacks, packaged sweets, refined carbohydrates, which are easy choices when stress eating. If you suffer from an autoimmune disease, these types of food are likely to intensify any symptoms you’re already experiencing. While both are essential to human health, there are major differences. Minerals are inorganic elements that are not broken down further. They maintain their chemical structures through the digestive process and are used by cells in their ionic or elemental forms. There are thirteen essential elements, divided into macronutrients and micronutrients. Vitamins, on the other hand are fat or water-soluble organic compounds that are broken down by the body into smaller components or used as enzymes to support biochemical reactions. 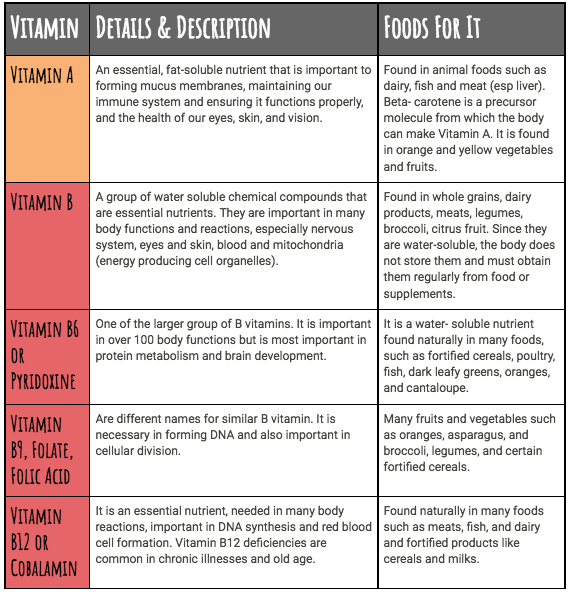 This article will discuss a selective group of vitamins and minerals that are particularly important for people with autoimmune conditions. Vitamin A – An essential, fat-soluble nutrient that is important to forming mucus membranes, maintaining our immune system and ensuring it functions properly, and the health of our eyes, skin, and vision. Found in animal foods such as dairy, fish and meat (esp liver). Beta- carotene is a precursor molecule from which the body can make Vitamin A. It is found in orange and yellow vegetables and fruits (2). Vitamin B – A group of water soluble chemical compounds that are essential nutrients. They are important in many body functions and reactions, especially nervous system, eyes and skin, blood and mitochondria (energy producing cell organelles). They are important in many body functions and reactions, but differ slightly chemically depending on the subgroup (3). Vitamin B6, pyridoxine – One of the larger subgroups of B vitamins. It is important in over 100 body functions but is most important in protein metabolism and brain development. It is a water- soluble nutrient found naturally in many foods, such as fortified cereals, poultry, fish, dark leafy greens, oranges, and cantaloupe (4). Folate, folic acid, vitamin B9 – Are different names for similar B vitamin. It is necessary in forming DNA and also important in cellular division. Many fruits and vegetables such as oranges, asparagus, and broccoli, legumes, and certain fortified cereals. Vitamin B12, cobalamin – Is an essential nutrient, needed in many body reactions, important in DNA synthesis and red blood cell formation. Vitamin B12 deficiencies are common in chronic illnesses and old age. Found naturally in many foods such as meats, fish, and dairy and fortified products like cereals and milks (5). Vitamin C – An essential nutrient that acts as a powerful water soluble antioxidant. It is found naturally in many fruits and vegetables and is involved in immune functions and tissue repair. Many fruits and vegetables are rich in vitamin C: Strawberries, oranges, kiwis, kale, tomatoes, and broccoli (6). Vitamin E – A group of fat-soluble compounds with antioxidant properties. They are important in immune activities, as well as eyes and skin healing damage. Vitamin E (alpha-tocopherol) is the form that is most useful to us. It is found in many foods, but is most abundant in green leafy vegetables, nuts, and certain vegetable oils. Almonds, sunflower seeds, peanuts and spinach (7,8). Vitamin K – A group of structurally similar, fat-soluble compounds. They are key in blood clotting and bone metabolism. 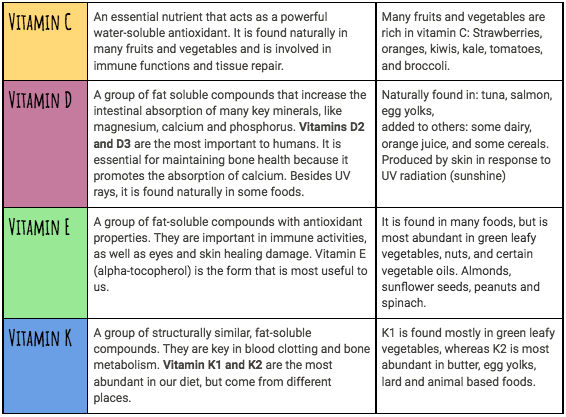 Vitamin K1 and K2 are the most abundant in our diet, but come from different places. K1 is found mostly in green leafy vegetables, whereas K2 is most abundant in butter, egg yolks, lard and animal based foods (9). Calcium – An essential chemical element that is particularly important for the growth of bones and teeth. Another essential electrolyte, calcium and magnesium work together in a 2:1 ratio in bones and blood. It is found naturally in many foods such as dairy products, green leafy vegetables, fish, nuts and seeds (10). 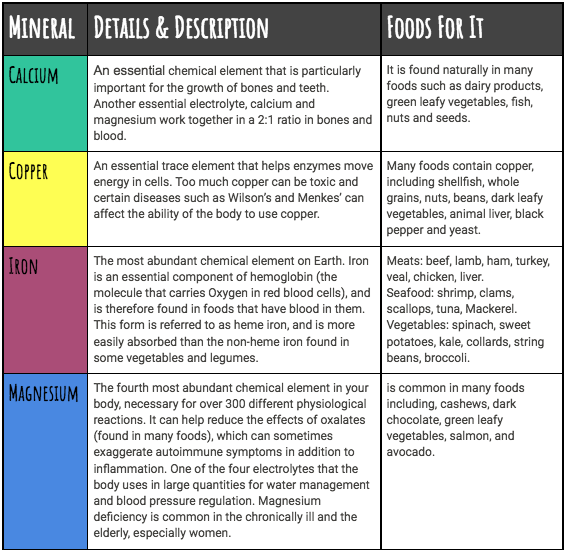 Copper – An essential trace element that helps enzymes move energy in cells. Too much copper can be toxic and certain diseases such as Wilson’s and Menkes’ can affect the ability of the body to use copper. Many foods contain copper, including shellfish, whole grains, nuts, beans, dark leafy vegetables, animal liver, black pepper and yeast (10). Iron – The most abundant chemical element on Earth. Iron is an essential component of hemoglobin (the molecule that carries Oxygen in red blood cells), and is therefore found in foods that have blood in them. This form is referred to as heme iron, and is more easily absorbed than the non-heme iron found in some vegetables and legumes. It is found in meats such as beef, lamb, ham, turkey, veal, chicken, liver; in seafood like shrimp, clams, scallops, tuna, mackerel; and vegetables such as spinach, sweet potatoes, kale, collards, string beans, broccoli (11). Magnesium – The fourth most abundant chemical element in your body, necessary for over 300 different physiological reactions. It can help reduce the effects of oxalates (found in many foods), which can sometimes exaggerate autoimmune symptoms in addition to inflammation. One of the four electrolytes that the body uses in large quantities for water management and blood pressure regulation. Magnesium deficiency is common in the chronically ill and the elderly, especially women. It is common in many foods including, cashews, dark chocolate, green leafy vegetables, salmon, and avocado (10). Phosphorus – An essential element that forms the sugar-phosphate backbone of DNA and RNA. It plays a key role in the transfer of energy in cells during ATP synthesis and is key to proteins. It is found naturally in both plant and animal foods, but most easily used by our body when consumed from animal products. Animal products high in phosphorus include beef, ham, turkey, chicken, dairy products, fish, scallops. Plant products include sunflower seeds, whole grains, beans, and nuts (10). 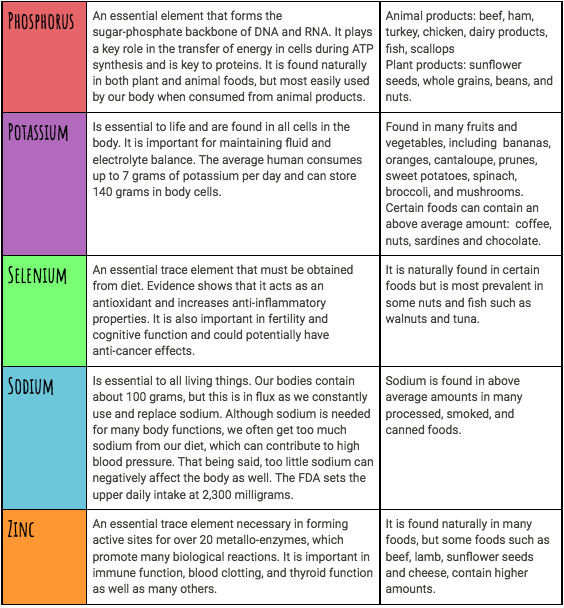 Potassium – Is essential to life and are found in all cells in the body. It is important for maintaining fluid and electrolyte balance. The average human consumes up to 7 grams of potassium per day and can store 140 grams in body cells. Found in many fruits and vegetables, including bananas, oranges, cantaloupe, prunes, sweet potatoes, spinach, broccoli, and mushrooms. Certain foods can contain an above average amount such as coffee, nuts, sardines and chocolate (10). Selenium – An essential trace element that must be obtained from diet. Evidence shows that it acts as an antioxidant and increases anti-inflammatory properties. It is also important in fertility and cognitive function and could potentially have anti-cancer effects. It is naturally found in certain foods but is most prevalent in some nuts and fish such as walnuts and tuna (10). Sodium – Is essential to all living things. Our bodies contain about 100 grams, but this is in flux as we constantly use and replace sodium. Although sodium is needed for many body functions, we often get too much sodium from our diet, which can contribute to high blood pressure. That being said, too little sodium can negatively affect the body as well. The FDA sets the upper daily intake at 2,300 milligrams. Sodium is found in above average amounts in many processed, smoked, and canned foods (12). Zinc – An essential trace element necessary in forming active sites for over 20 metallo-enzymes, which promote many biological reactions. It is important in immune function, blood clotting, and thyroid function as well as many others. It is found naturally in many foods, but some foods such as beef, lamb, sunflower seeds and cheese, contain higher amounts (10). These vitamins and minerals are essential for everyone, and may be of particular importance to those with autoimmune diseases due to their anti-inflammatory and antioxidant properties. With this breakdown we hope to ease your journey through navigating the information surrounding dietary supplements.